Centrifuge machines work on a principle of sedimentation, in which, centripetal acceleration is used for parting the substances having variable densities. In a 4 Point Centrifuge the vibration are isolated with a help of heavy Inertia Plate and Anti Vibration Mounts instead of a 3 Point pendulum suspension where the vibration of Centrifuge are isolated with a help of Spring and Pendulum Bolts arrangement. We are manufacturer and supplier of Bottom Discharge Centrifuge Machine. These are known in market for their distinctive features like robust construction, easy to use, low maintenance, and highly efficient performance. The centrifuge has diameter of 72 inches. Glass agencies are manufacturer of centrifuge machine electrical. 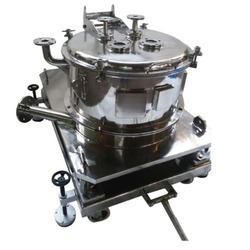 With our past experience and knowledge in this field, we are engaged in manufacturing a quality-assured range of Industrial Centrifuge Machine. We bring for you, the Four Point Bottom Discharge Centrifuge Machine. These are developed using latest technology. They are highly durable and fully automatic. 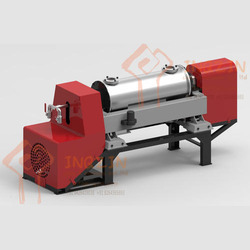 These Centrifuge's are manufactured in compliance with the international norms with inertia platform and vibration isolating dampers to give smooth operation.